50-Plus Years Of Reading: While in my doctor's waiting room recently, I picked up the current issue of Motor Trend from the office's magazine rack. Almost every news piece was about something I had already read. Mostly on the net. Between the Detroit News and Detroit Free Press websites plus the many excellent blogs around, I can easily keep up-to-date about the latest car happenings. A few years ago, I dumped Automobile Quarterly (after 25+ years or so). I had subscribed AQ because it had outstanding marque stories and photographs. The magazine was sold and the new owner turned it into a pile of junk. Photo quality dropped way off. The quality of the writing declined. All of the old writers/contributors/editors disappeared. Graphics went lowbrow and page layout was jumbled and hard-on-the-eyes. So I canceled AQ - but it took 7 phone calls and three months to get my refund. Jerks. I bought my first car magazine in 1954 - Motor Trend. If I had taken all the money I've spent on pulpy car magazines over the past 50-plus years and invested it in a good no-load mutual fund, I'd probably have enough money to buy four new Jaguars - top-of-the-line, supercharged Jaguar XKRs! Aside from Motor Trend, there was Motor Life (I think it went out of business in 1957 or so). Then there was Car Life which went belly-up in the late '50s but was reincarnated by the Road & Track folks in the early 1960s but folded again about ten years later. That's a shame because it was a pretty good mag. I loved reading witty stuff written by Henry Manney III. Then he died. I guess that Henry's death and being snickered at by the Germans kinda soured me on R&T, so I stopped subscribing to it in the early 1990s. Sometimes I bought Hot Rod and Rod & Custom, especially if they had anything about Ed 'Big Daddy' Roth in it. And, of course, Mechanix Illustrated just to read Uncle Tom McCahill. He was a wonderful writer with a great sense of humor and had something new and interesting to say every month. Later in life, as I got interested in old cars, I subscribed to Special Interest Autos and Collectible Automobile. But I bailed on them because they ran out of old cars to cover, so they started to write about cars of the 1970s and 1980s. I don't particularly care about that automotive era. I'm sure they did it to appeal to a younger audience, but they lost my interest and my business. I used to love Motor Trend's spy shots of future cars. Or photos of the latest concept cars from various auto shows. Now I get those things instantly from the Internet or see them the next week in AutoWeek. By the time MT gets around to publishing them, they're old hat. I used to enjoy MT's articles on performance and styling modifications. There used to be lots of ways to do either - in the past, MT offered hundreds of suggestions. Now it offers only two - buy a performance chip or buy new alloy wheels. Who wants to read about that same old stuff every month? MT used to test cars and an occasional truck. Now it's the other way around. (I'm not particularly interested in trucks, SUVs or vans) So I dropped my Motor Trend subscription a few years back. The Perils Of Auto Predictions: I have in my possession Popular Mechanics '1957 Cars Fact Book'. I bought it new as a 13 year-old (paying the then-dear sum of 75¢ for it) and have carted it around from dwelling to dwelling ever since. I've lost the front cover but otherwise, it is largely intact. The softcover's author was Arthur R. Railton, Automotive Editor of Popular Mechanics Magazine. Within the mag-style 'book', there is a section entitled 'Predictions For 1958', found on page 128. "Both Pontiac and Chevrolet will have all new cars - both will use the long-awaited unitized (body) construction." GM unibodies didn't happen until the 1960 Corvair appeared. "If Studebaker and Packard are successful this year, they will be all new in 1958. Hudson and Nash will be all new too." Ummm ... good luck with all that. "According to people who should know, the E-car (Edsel) is not going to be spectacular. It is going to be a conventional car but one built to provide the utmost in comfort." Well, I guess it wasn't 'spectacular' but it looked like nothing else on the road. 'Conventional' was hardly the word I would have used in describing the Edsel. And it wasn't really any more comfortable than a '57 or '58 Mercury. "... several more cars will adapt the idea of a rear window that lowers as it does in the 1957 Mercury Turnpike Cruiser." Only the '58 Continental Mark III did so. "Spare tires, in the current sense may disappear ... in 1958. ... You'll still have a spare but it will be a collapsed tire folded up into a neat box that fits in one corner of the trunk. Should you get a flat, you simply pull out the collapsed tire, inflate it with a tank of compressed gas (which will serve as an emergency fire extinguisher also) and you're all set." That "neat box" did not appear in '58 at all. I also have the PM '1959 Cars Fact Book' and can report that Arthur wisely made no predictions about the 1960 models. Downward Trend: Interlink, the parent of Motor Trend as well as Hot Rod and Automobile has filed for bankruptcy, citing a "decline in decline in advertising spending, especially among automotive companies, as well as rising costs for raw materials." Interlink also publishes a bunch of specialty auto mags - most of which I've never heard of (Eurotuner, Modified Luxury & Exotics, Lowrider Arte, etc.). I think I met Lowrider Arte at a swap meet once; I didn't know he had his own magazine - an impressive accomplishment for such a short man. Most car mags saw sales peak in the late 1980s and have attempted to maintain circulation levels by offering deeply-discounted subscriptions. With declining subscription revenue, auto mags have become more advertiser-dependent than ever. This has made them less critical and more sycophantic in tone. And, in the internet age, their news, spy shots and road tests are stale by the time they reach one's mailbox. By comparison, Quant stats indicate that Jalopnik has over 1,700,000 visitors per month - that's more than a year's print circulation for the most popular print car magazine. AutoBlog comes in a little under 600,000 visitors per month, while The Truth About Cars gets just under 500,000/month. Auto Weak: Jack Baruth at The Truth About Cars has an update on the latest AutoWeek antics. "Our not-quite-colleagues at AutoWeek are between a rock and a hard place nowadays. Back in the dinosaur days of the biz, subscribing to AW made sense. The writing was usually auto-weak, and there wasn't much insight to be found in the reviews, but it was far more timely than the rest of the color rags." The only print mag I still get is Model Auto Review, a small model car magazine produced in Great Britain. I've been a MAR subscriber since it began publishing 30 years ago. My "subscription" to AutoWeek came to an abrupt end when I was scammed a few years back. AutoWeek claims a paid circulation of almost 280,000. But, now that they've become an every-other-week publication, I've heard from industry friends that the "real" number is a lot lower. I don't miss AW. By the time AutoWeek publishes something in print, it's already "old news" on the internet. As Nelson Muntz might say, "Haw-Haw. Your publication has become irrelevant." Of course, there's still time to sign up for that overpriced "AutoWeek Fantasy Camp", including accommodations at the historic Dearborn Inn, which - like Autoweek - is well-past its sell-by date. On the plus side, it's an easy walk to the Henry Ford Museum & Greenfield Village, which might be a more interesting experience than the camp. Making Change: Peter De Lorenzo, the Autoextremist, has written that the death of David E. Davis, Jr. "pretty much signals the end of the car magazine business itself." Baloney. I've been writing about the decline of print media - including car mags - for years. So have others. Davis' demise is neither a game-changer nor a trend changer. De Lorenzo has observed, "Over the years of doing this publication (My clarification: Peter is referring to the online-only Autoextremist, which is more of a blog than a "publication" and not a very active blog at that - it is generally updated once a week or less. ), it became clear to me and countless other people in this business that the traditional print car magazines were dead - they just didn't know it yet. Scrambling to catch-up while shoring up their online presence, the car mags tried to reinvent the model and at least get with the program, but to a bunch of enthusiasts who grew up with the monthly anticipation of waiting for their favorite car mag, the new world of the Internet turned over the content anthill, and all of a sudden there were hundreds upon hundreds of car publications to choose from, and the traditional car mags instantly got lost in the 24/7 cacophony that defines the web world today." He concluded that "the traditional monthly print car mags are going to fade away like yesterday's news." Well, duh. And, may I add, "Boo-freaking hoo." As Nelson Muntz might say, "Haw-Haw. Your information delivery system has become irrelevant." Capitalism is about creative destruction. American capitalism is especially dynamic, quickly adapting new technologies and obsoleting once-solid business segments. In the 1940s, 97% of all goods moved by rail. Today, most goods travel by truck along interstate highways. Railroads are shadows of their former mighty selves. In 1966, I took a job at a plastics sales support lab, which employed 70 people. It no longer exists, because profit margins on plastic materials have been squeezed to the point where the company could no longer offer such a free service and because customers are now more willing to solve their own problems. In the mid-1960s, the company I worked for had almost 40 people in their national field sales force. Now, it's probably a half-dozen or less. E-mail and the Web have profoundly changed the sales transaction process. Far fewer people are needed to service accounts. Amazon.com has replaced the neighborhood book store. iTunes has killed the traditional record shop. Little car repair shops are dwindling as automobiles need less maintenance and have become less problem-prone. The small neighborhood cafes, diners and sub shops of the 1950s have been replaced by McDonald's and Starbucks. The corner tavern has mostly disappeared; people now get their social interactions from Facebook. You'll have a hard time finding a pay phone these days because everyone now carries their own personal communication device. Change can be good or bad, depending on your viewpoint. And whether you're on the morning side or twilight side of the trend. The Genius Behind Automobile Quarterly: Founder, former owner and publisher of Automotive Quarterly, L. Scott Bailey, has died at age 87. Pioneer Auto Writer: Walter A. Woron, the first editor of Motor Trend magazine, has died at age 91. The enthusiastic hot-rodder and former racer at SCTA dry-lakes events was also a connoisseur of fine machinery. Walt once owned a concours-winning 1948 Lincoln Continental cabriolet. After stints as a tech writer for Douglas Aircraft and freelancing for Speed Age magazine, Woron became Motor Trend's first editor in 1949 and remained in the position until 1960. To distinguish MT from Hot Rod, the only other Petersen auto publication at that time, Walt sought to shape it in the image of Motor, a British car mag, with a broad editorial menu that included testing of new automobiles. Woron noted, "We started with just a stopwatch and a clipboard, using the car's speedometer as our primary instrument. It wasn't very scientific." Fellow auto scribe Michael Lamm interviewed Woron in 1996 and found that "MT‘s early tests were called 'Motor Trials' and the first two, in the October 1949 issue, tested an MG-TD and a 1950 Studebaker Champion. Next came a 1949 Cadillac, but this took the form of a feature article written by an engineer and freelance writer named John Bond, the young man who would later edit and publish Road & Track. Bond called the Cadillac "the outstanding car of 1949," basing his opinion on its new overhead-valve V-8. Yet there was no award nor any attempt at that point to establish a formal Car of the Year." Lamm also wrote, "I personally remember a couple of road tests that set the early standard for 0-60 times. One was the 1950 Oldsmobile 88, the other the 1951 Chrysler. Oldsmobile posted a 0-60 time of 12.22 seconds and a top speed of 92.11 MPH. The heavier Chrysler Hemi V-8 did 0-60 in 14.39 seconds and topped 106 MPH. To show how quickly the horsepower race took off, by 1957 the Chrysler 300C turned 0-60 in eight seconds flat." 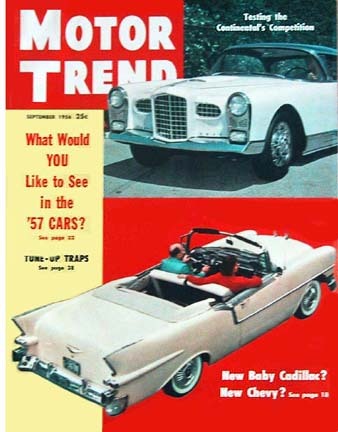 Motor Trend debuted with a print run of 40,000 for the first issue in September 1949. By August 1950, sales had jumped to 138,000, then 254,000 in 1951 and 343,000 in 1952. By May 1953, Motor Trend‘s readership nudged half a million. After 11 years leading Motor Trend, Walt Woron left for New York, where he worked in public relations and advertising, handling Peugeot, Renault and Jaguar. In 1966, he briefly rejoined Motor Trend as editor but was dismayed to discover that "instead of concentrating on magazine content, these meetings focused on upcoming promotions, ways to increase ad revenue and circulation, covers created by committee; all this coupled with intolerable office politics. I thought the magazine had lost its direction. It certainly lost its personality." Walt became West Coast editor for Automotive News, subsequently worked for Stanley Publishing and ended his automotive career as editor of Road Test magazine. After retiring from RT, he and his wife opened a retail antique business. A Legacy Of Bad Choices: Motor Trend has selected the Tesla Model S as its 2013 Car of the Year. It is the first all-electric car to ever win the award. The Chevrolet Volt hybrid was selected as MT Car of the Year for 2011. This award used to get me somewhat excited until I read a revealing 2003 posting by Peter De Lorenzo, the AutoExtremist, which detailed how this 'award' is "for sale" to the manufacturer that showers Motor Trend with the most ad/promo money. Industry insider De Lorenzo's comment shed light a lot of previous COTY choices to me. In 2002, the faux, late-to-the-party and trouble-plagued New Ford Thunderbird won top honors. The 2001 award went to the meretricious and underpowered PT Cruiser. In 1997, the perennial Rental Car Queen Chevy Malibu, a vehicle more boring than either 'Dune' the book or 'Dune' the movie, was presented with MT's top prize. In 1988, another member of GM's Rental Car Royalty, the Pontiac Grand Prix, was crowned. In 1983, the still-unloved Renault Alliance won the coveted prize. The deplorable Chevrolet Citation was named the Car of the Year in 1980 by MT. The Citation was one of GM's X-body horrors, which seemed to Motor Trend like a great idea at the time, in the same way that everything seems 'profound' after a lot of drinking or serious head trauma. In 1976, the twin rattletraps known as the Dodge Aspen and Plymouth Volare shared the prize. Since most of them rusted away and/or fell apart, they are now seen less often than a Higgs boson particle. Back in 1974, you could listen to Lynyrd Skynyrd perform Sweet Home Alabama using the eight-track player inside the miserable Mustang II. This muffin stump of the 1970s automotive universe, whose only saving grace was that, as a junkyard resident, it donated many a subframed front-end for late '30s and early '40s street rods (including my '39 Plymouth), won MT's COTY in '74.